Aktolagay, a snow-white mountain range almost 50 km long and about 10 km wide, is located in the southwest of the Aktobe region. 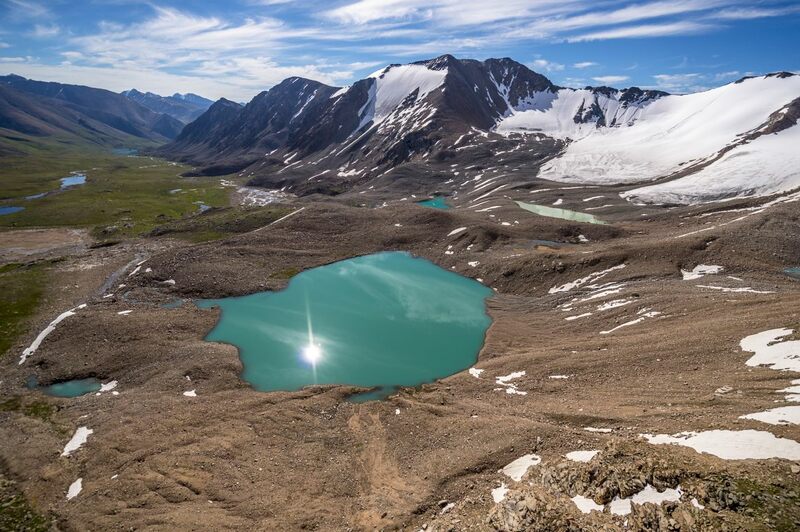 The unusual, almost unparalleled landscape of the plateau makes it unique and attracts people interested in geotourism and auto-travelers. In the distant past, it was the seabed. 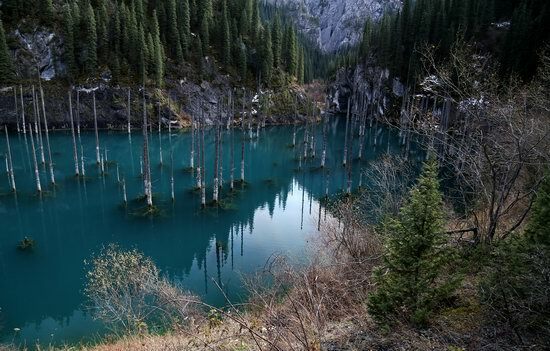 Here you can find fossilized remains of mollusks, bones and teeth of sharks and other living creatures that once inhabited the ancient sea. Aktolagay on Google Maps. Photos by: Natalya Kozlovskaya. Sor Tuzbair is a solonchak (salt marsh) located in the Mangystau region in the south-east of Kazakhstan. Almost the entire territory of this region is covered with saline and deserts, water sources are absent. 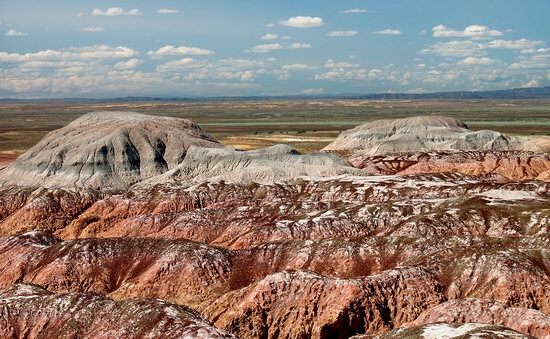 This is a picturesque area combining three colors: white – salt, limestone, clouds; blue – the sky; yellow-brown – the color of the soil, which emphasizes the whiteness of salt. 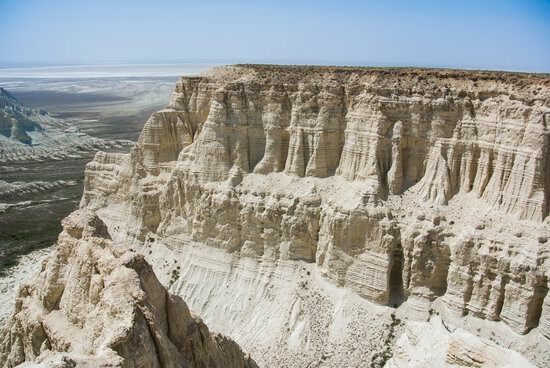 Sor Tuzbair is a natural combination of deserts, hills and cliffs. People come here to explore the salt marsh and conquer rocky peaks. Sor Tuzbair on Google Maps. Photos by: Natalya Kozlovskaya. 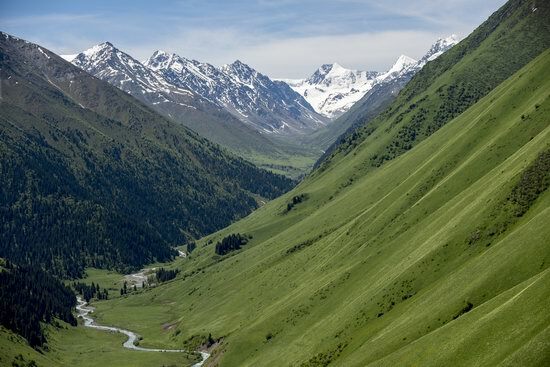 The Tian Shan is a mountain system located in Central Asia in the territory of five countries: Kyrgyzstan, Kazakhstan, China (Xinjiang Uygur Autonomous Region), Tajikistan, and Uzbekistan. It is one of the highest mountain systems in the world with more than thirty peaks over 6,000 meters high. 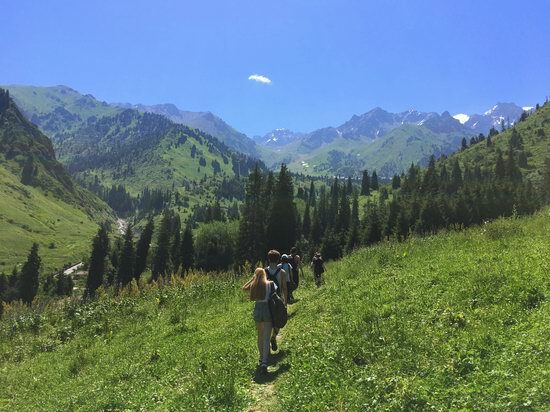 Let’s look at the landscapes of the northern part of the Tien Shan located in Kazakhstan, near Almaty. 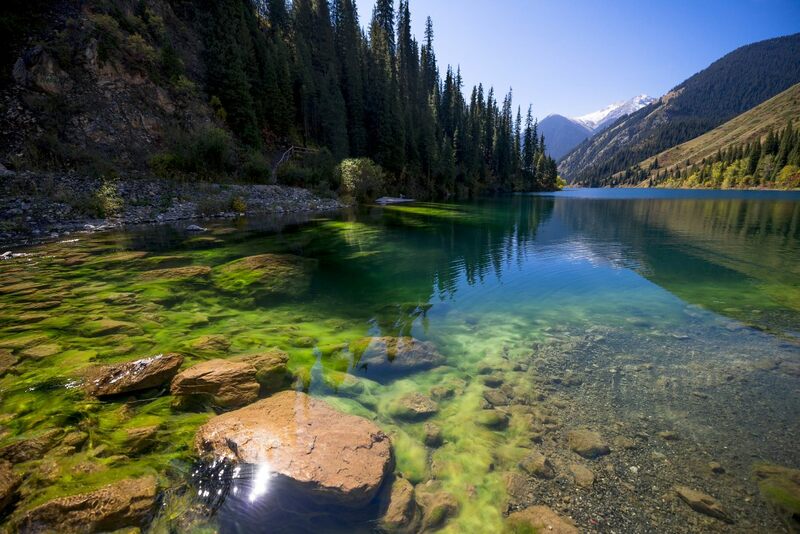 The mountains of the Northern Tian Shan are the most visited in Kazakhstan. Photos by: Grigory Bedenko. Big Almaty Lake located at an altitude of 2,511 meters above sea level. The Dzungarian Alatau is a mountain range located on the border of the Almaty Region of Kazakhstan and the Xinjiang Uygur Autonomous Region of China, between the Ili River and Lake Alakol. The mountains are named for the nearby desert. The length of this picturesque range is about 450 km, the width varies from 50 to 90 km, the height – up to 4,622 m (Semenov-Tian-Shansky Peak). The Dzungarian Alatau on Google Maps. Photos by: Grigory Bedenko. 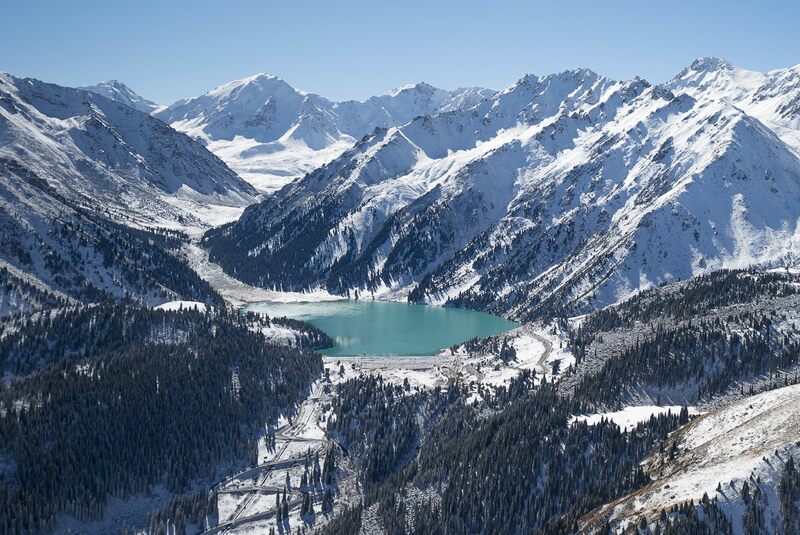 The Dzungarian Alatau is a mountain range located in the northeast of the Almaty region of Kazakhstan, between the Ili River and Lake Alakol. The range extends from the west-southwest to east-northeast along the state border of Kazakhstan and China. The length of the range is about 450 km, the width – 50-90 km. The main peaks of the Dzungarian Alatau rise above 4,000 m. The Dzungarian Alatau on Google Maps. Photos by: Grigory Bedenko. 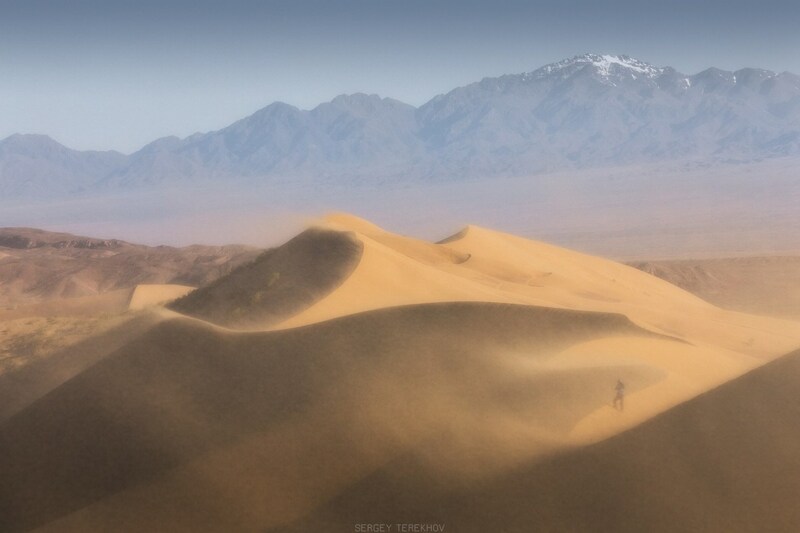 The Singing Barkhan is a large sand dune located in the territory of the Altyn Emel National Park in the Almaty region, 182 km northeast of Almaty. 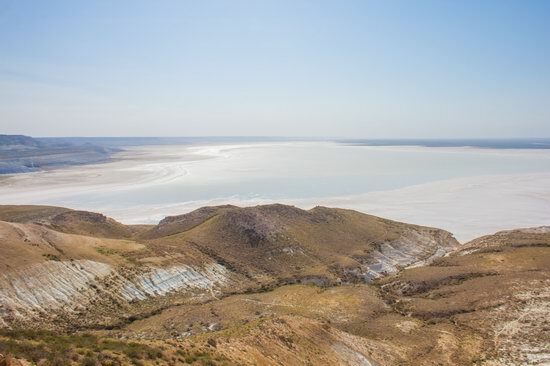 The length of it is up to 3 km, the height – about 150 m.
This natural monument is famous for the fact that in dry weather its sands emit sounds similar to an organ melody. The Singing Barkhan looks especially picturesque on a windy day. The Singing Barkhan on Google Maps. Photos by: Sergey Terekhov.